Anthony Watts at WUWT has a short article by David Middleton (archived here, latest update here). David has found an older paper about the West Antarctic Ice Sheet (WAIS), published in Science in 1999. David thinks it shows that the latest scientific research is "nothing new". He's wrong. 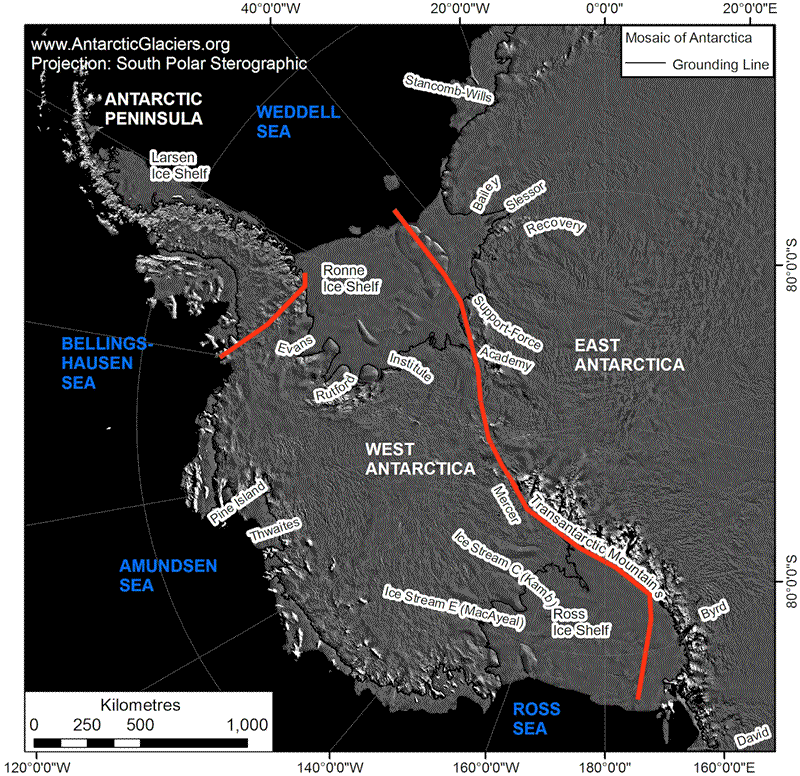 The WUWT article is a classic case of "look, squirrell", diverting attention from the most dangerous areas - particularly the Amundsen Sea Embayment and the Antarctic Peninsula, to the Ross Ice Shelf. There are principally three sectors of the ice sheet, which flow northeast-ward into the Weddell Sea, westward into the Ross Ice Shelf and northward into the Amundsen/Bellingshausen seas. The highest elevations reached are 3000 m above sea level, occurring at the divides between these sectors. The size of the West Antarctic Ice Sheet is limited, despite its high average snow falls, by the faster speeds of its ice streams. The grounding line of the WAIS has retreated nearly 1300 km since the Last Glacial Maximum (LGM) about 20,000 years before present. The grounding line today is about 900 km from McMurdo Sound, which implies average recession of about 120 m year−1 for at least 7500 years. Recent measurements indicate that grounding-line retreat is continuing at about the same rate; at Ice Stream C, it retreated about 30 m year−1 between 1974 and 1984 (29), whereas at Ice Stream B, it withdrew ∼450 m year−1 over the past 30 years (30). There is no evidence to indicate that recession is slowing; it will likely continue (at least in the near future) because the current mass balance of the Ross Sea Embayment is strongly negative (4). Others have suggested that West Antarctica deglaciated completely in the past and, if the grounding line continues to pull back at the present rate, complete deglaciation will take about 7000 years. Pine Island Glacier retreated 31 km at its center - that's 1,632 metres a year on average. Thwaites Glacier retreated 14 km along its fast-flow core - that's 737 metres a year on average. Haynes Glacier retreated 10 km along its flanks - that's 526 metres a year on average. Smith/Kohler glaciers retreated the most, 35 km along its ice plain - that's 1,842 metres a year on average. Compare the 120 metres a year in the Ross Sea Embayment estimated in 1999 with 1,842 metres a year of the Smith/Kohler glaciers in the Amundsen Sea Embayment estimated as at 2011. That's a huge difference. In 1999, Conway and co-authors concluded saying that the WAIS could "perhaps" completely disintegrate within the present interglacial period - that is, in the next 50,000 years! We suggest that modern grounding-line retreat is part of ongoing recession that has been under way since early to mid-Holocene time. It is not a consequence of anthropogenic warming or recent sea level rise. In other words, the future of the WAIS may have been predetermined when grounding-line retreat was triggered in early Holocene time. Continued recession and perhaps even complete disintegration of the WAIS within the present interglacial period could well be inevitable. We conclude that this sector of West Antarctica is undergoing a marine ice sheet instability that will signi cantly contribute to sea level rise in decades to come. That's decades to come, not centuries to come or millenia to come! What about the Ross Ice Shelf? It looks as if the Ross Ice Shelf will be okay for the near term (the next couple of centuries at least). I found this 2013 paper that discusses recent changes in the Ross Ice Shelf, but only the abstract. It mentions "widespread slowing and minor areas of acceleration in the Ross Ice Shelf". So the Ross Ice Shelf does look to be okay for a while yet. Our model further suggests that a projected increase in snowfall will protect the Ross and Filchner–Ronne Ice Shelves from hydrofracturing in the coming two centuries. Dr Kuipers Munnekke said: "If we continue to burn fossil fuels at the current rate, almost all ice shelves in the Antarctic Peninsula will be under threat of collapse in the next 200 years. Only the two largest ones seem to be safe. Even in the much colder eastern part of Antarctica, some ice shelves could disintegrate. If we manage to keep global warming below the European Union target of 2oC, more than half of the ice shelves could be saved, compared to no action taken on emissions reductions." Soooo if its been going onward for 20000 years what is the likely hood that it will be done and gone in the next 200? Collapse of the Ross was all the alarmist rage from this paper until the Andrill program in 2005-2007 (if I recall correctly) that showed it hasn’t for three million years and very likely won’t now. anchored by islands, decelerating that sort of thing. The 2014 alarm was fed/manufactured by NASA and by knowingly wrong comments by Rignot of JPL. For example, the 1.2 meters is the calculation of all the ice in the entire catchment basin of 360,000 square km. one of the two papers at issue showed that the interior portions are gaining ice and have virtually no seaward creep. Neither the NASA PR, the NASA website, nor Rignot mention these facts. Pure alarmism, one presumes perhaps in support of the NCA/EPA/Obama agenda in an election year. Rud is wrong of course. He is also referring to different areas of WAIS without distinguishing between them. He is only talking about the Amundsen Sea Embayment when he refers to "the 1.2 meters", not the entire WAIS and not the Ross Sea Embayment. In any case, contrary to what Rud claims about "no seaward creep", the latest paper by Rignot et al shows the very fast rates of flow into the ocean as I described above. They will say anything to maintain the funding. The goal is funding, not science. In fact the corruption is so bad the research and work ups have become childish and the Warmists desperately try to say something that was not said the week before. The trouble with all these ‘catastrophic’ ice sheet collapses is that they all happen so slowly no-one ever notices. Except the alarmists, of course, looking for an excuse to impose their view of the world on everyone else. So the latest paper from Rignot et al., proclaiming the “Irreversible Collapse” of the West Antarctic Ice Sheet, is basically a repeat of this older paper from 1999. Why is it that alarmist researchers can rehash old stuff without having a reviewer say, “The overall innovation of the manuscript is very low,” as they did with the Bengtsson paper? You’re right. It doesn’t apply to the Amundsen Sea. The ~10% of the WAIS drained by the PIG is IMO a special case, not least because of the Hudson Mountain volcano & maybe higher precipitation in its basin (haven’t checked on the latter though, & in any case it’s hard to work in that area; IIRC the 2012 summer expedition had to be cancelled due to even more inclement than normal WX). Thanks, idunno. That's a solid, well-written article with a very stern warning and a strong plea for action by someone who knows what's happening more than almost anyone else. The article is great; the comments are predictably dismal. The Conway 99 article got pasted in a few times in the guardian comments for some reason. The West Antarctic Ice Squirrel seems to breed very prolifically. What pushed Judith Curry over the edge?